Located in the northwest corner of Canada, the Yukon is a remote federal territory with a total population of just under 36,000 people. Over two-thirds of the population live in Whitehorse, the Yukon’s capital and only city. The rest of the territory is wilderness—plunging rivers and soaring mountains, all flanked by dense forests of pine and spruce. For much of the year, the Yukon is covered in snow and ice—yet despite its inhospitable climate (or perhaps because of it), it has served as a beacon for intrepid explorers since the advent of the 19th-century fur trade. Pioneers, gold miners, outdoorsmen and travelers have all found themselves drawn by the Yukon’s promise of freedom and adventure. If you find yourself similarly tempted to answer the siren call of the wild, one of the best ways to do so is on horseback. Run by native Yukoners Mandy and Armin Johnson, Yukon Horsepacking Adventures offers visitors from all over the world the chance to immerse themselves in their wilderness lifestyle. Here's a look at what it’s like to leave the rest of the world behind on a multi-day horseback trip into the heart of the Yukon. Yukon Horsepacking Adventures lies at the southern end of Fox Lake, an area of breathtaking natural beauty located approximately 37 miles/60 kilometers north of Whitehorse. If you’re flying in from southern Canada, it’s worth spending a night or two in the territory’s capital before heading out to the ranch. It’s the hub around which tourism in the Yukon revolves, and a scenic city in which to stock up on supplies, sample local cuisine or enjoy the benefits of hot water and conventional plumbing before venturing into the bush. The pastel-colored clapboard houses that line Main Street evoke the city’s frontier history. To the southeast, the mighty Yukon River flows past clear and cold beneath the watchful eye of historic sternwheeler SS Klondike. For accommodation, try the Gold Rush Inn, a comfortable, friendly option complete with its own Western saloon. When you’re ready to leave the city behind, head north (via taxi or rental car) along the Klondike Highway. You’ll see signposts to the ranch on the left-hand side. A brief drive along a gravel road takes you to Mandy and Armin’s rural paradise. The ranch is nestled in a verdant valley at the foot of Grizzly Mountain. In summer, the horse-filled paddocks are a patchwork of impossible green in between the ranch and the distant tree line. Mandy and Armin are the quintessential Yukon family: they have worked with horses for most of their lives, they race sled dogs in the winter and have gold claims up in Dawson City. Their horses are glossy and well-fed, ranging in color from dark bay to classic pinto. You don’t have to be an experienced rider to join one of the outfit’s multi-day trips—the horses are impeccably well trained and know the trails instinctively. These extended trips can last anywhere from three to seven days, and destinations are chosen according to the amount of time you have, the size of your group, your riding experience and your specific interests. Shorter trips usually explore the majestic wilderness of Grizzly Mountain—while other options include adventures into the Tombstone Mountains or along the historic Dawson Trail. No matter which route you decide on, all groups are accompanied by two of the ranch’s first class guides. They’re trained in First Aid, and put a huge amount of effort into making your trip special. After being paired with your horse and receiving a briefing about riding techniques and what to expect from the next few days, the real adventure begins. Your initial nerves fade quickly, as the scent of leather tack, pungent spruce and crisp, clean air fills your lungs. There is no cell reception here—and once you enter the forest, the rest of the world is a distant memory. Your soundtrack is the song of hooves, deadened by the carpet of fallen pine needles. Every now and then, a red squirrel calls a warning from the branches above—a whirring chirp that signals its resentment of your intrusion into its kingdom. Life is slower here. The trees grow so closely that the horses are confined to a walk—and when you break free of the tree line, the elevated scenery is so mesmerizing that you need time to take it all in. Every day, you will discover new secrets—a lush meadow full of fleeing spruce grouse, or a steep valley studded with hidden lakes. The mountains seem bare from a distance—but up close, they’re a rugged microcosm of slippery scree and tangled bush. Purple fireweed grows abundantly in spectacular contrast with the Yukon backdrop of emerald green and sapphire blue. The time that you’re not in the saddle is an experience in its own right. During the day, you’ll stop for picnic lunches and unmissable photo opportunities—and by late afternoon, you will arrive at one of the outfit’s wilderness camps. Facilities are basic: a picket for the horses, a ring of stones for the campfire and a wooden platform in the trees for keeping supplies away from marauding bears. The bathroom is a hole dug into the forest floor, and if you want to bathe, you’ll need to brace yourself for a dip in an ice-cold creek. It takes a surprisingly short space of time to get used to (and indeed fall in love with) this way of life. It helps that the views are unparalleled, and the company exceptional. Meals are cooked over the campfire, and consist of cowboy specialties like chilli and bannock, cornbread and fiercely strong coffee. By the end of a long day in the saddle, dinners like these are amongst the best you’ve ever tasted. Bear safety is important: the horses wear Swiss-style cowbells around their necks at night to ward off predators, and food is strictly kept outside the tents. The guides carry bear spray and a rifle in case of emergency—but in general, the bears give people a wide berth. Perhaps the strangest thing for visitors to get used to is the light—in the height of the Yukon summer, the sun stays in the sky for 19 hours a day, and true darkness never really falls. The Yukon is full of free-roaming wildlife, a fact that makes every day on the trail exciting. Bears are at the top of many people’s bucket list, but although both black bears and grizzlies live here in abundance, encounters are rare. Similarly elusive are the gray wolf and the Canadian lynx, but the chance of spotting other wildlife is high. Dall’s sheep and wide-antlered moose roam the mountains, while wood bison, elk and mule deer are also often spotted. Camp is usually shared with inquisitive Arctic ground squirrels; while the rivers teem with Arctic grayling. Keep an eye out for birds, too—from eagles riding the thermals above your head, to Barrow’s goldeneye ducks on the lakes. Summer is the optimum season for horse riding, although Yukon Horsepacking Adventures also offers winter rides. For the best weather, plan your trip for late July or early August. Mosquitoes can be an irritation at this time of year—but the warm temperatures more than make up for having to douse yourself in repellent. The best insect repellent includes a high percentage of DEET, and should be at the top of your packing list. Other essentials include sun protection and ample wet and cold weather clothing, just in case. For riding, heeled boots and long pants are best. Other than your personal items and sleeping bag, all camping, cooking and equestrian equipment is provided. 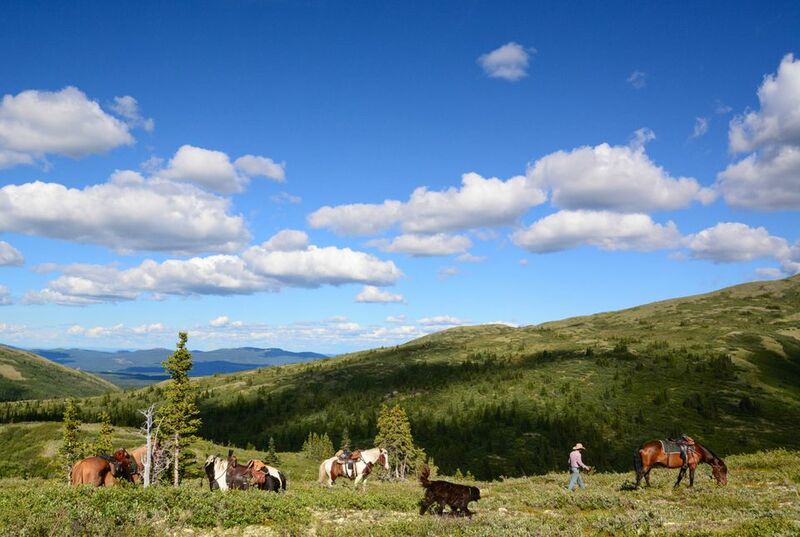 Yukon Horsepacking Adventures also offer day rides and cabin rentals. If you have your heart set on seeing the land in its icy finery, winter activities include dog sledding, snowshoeing and ice fishing on Fox Lake.